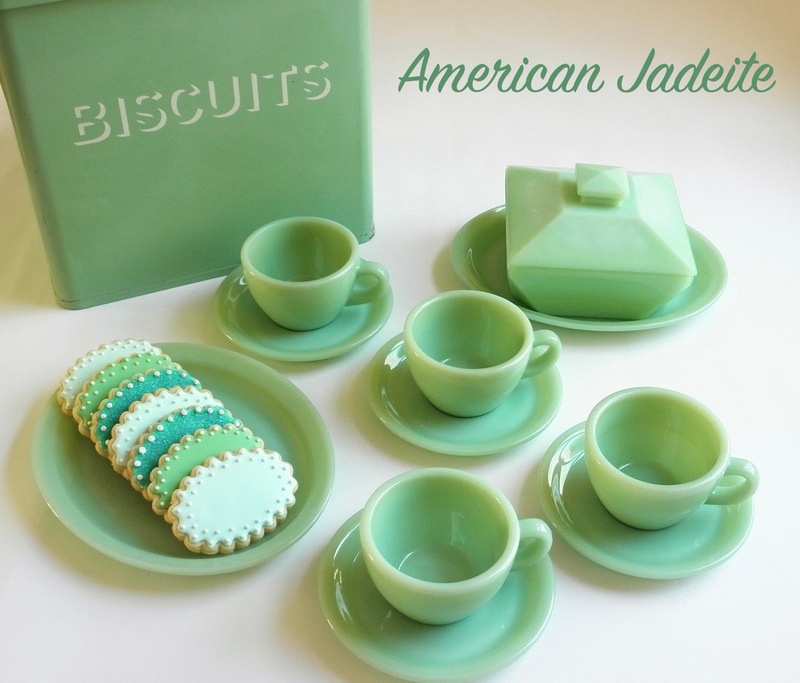 It’s no secret that I love collecting jadeite and that I enjoy using it on a weekly basis. Although I have gathered several pieces throughout the years, I still consider myself a budding collector of it. What pieces I do have I cherish immensely for many reasons. 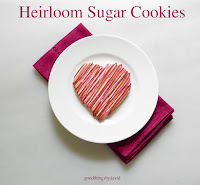 A few of them were gifted to me, while most were lucky finds from antique shops and flea markets, or were purchased from Martha by Mail many years ago. As much as I pride myself in organizing the spaces in my home, I honestly did not have a dedicated area for my jadeite up until now. 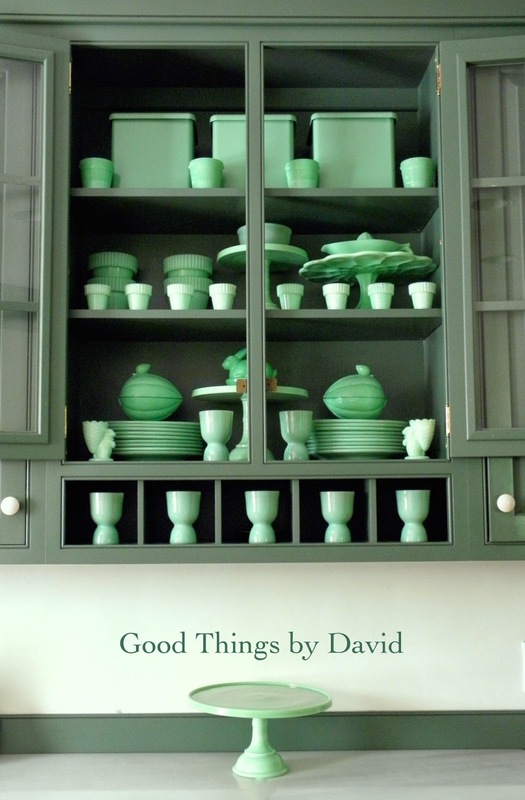 After clearing out some Wedgwood from a cabinet, I decided that the beautiful tones of my vintage and contemporary jadeite would look wonderful against the ‘Peale Green’ cabinets in the kitchen. This historic color from Benjamin Moore will sometimes be a rich, deep green and at other times will reveal a different shade giving off a lot of gray undertones. It all depends on the time of day and what kind of weather we're having. The color combination is a good one to my mind, because it is not jarring or unpleasant to look at if I happen to be in the kitchen. What I tried to create was a bit of harmony with these miscellaneous pieces since I don’t have two or more of everything. Sectioned between three shelves on a glass-fronted cabinet, I went about dividing up the jadeite based on height and numbers. You’ll see what I’m talking about when you look through my cabinet. At the very top of the shelf I have some enamelware canisters (these are powder-coated steel) and some little jadeite buckets. The canisters and the little buckets were exclusive to Martha by Mail. The middle shelf has Fenton flower pots, both large & small. 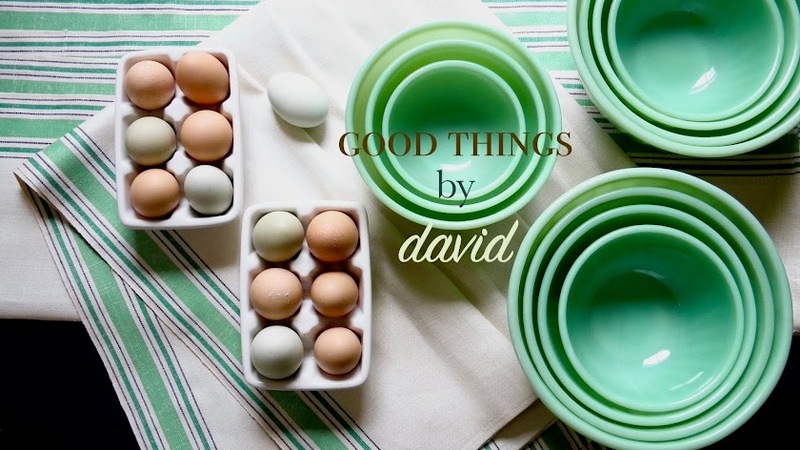 The versatility of these pots has me reaching for them quite often when I'm setting a table. The L.E. Smith 8" cake stand in the middle has a McKee 5" mixing bowl sitting on it, while the scalloped cake stand with the intricate underside has a citrus juicer from the 1940s. The cake stands & flower pots are Martha by Mail. The lower shelf is also a mix of old & newer jadeite. The stacks of Restaurant Ware dinner plates are 1940s Fire King, as are the two double-egg cups. The covered melon compotes, covered bunny dish sitting on a 10"cake stand, as well as the bunnies with baskets are Martha by Mail. 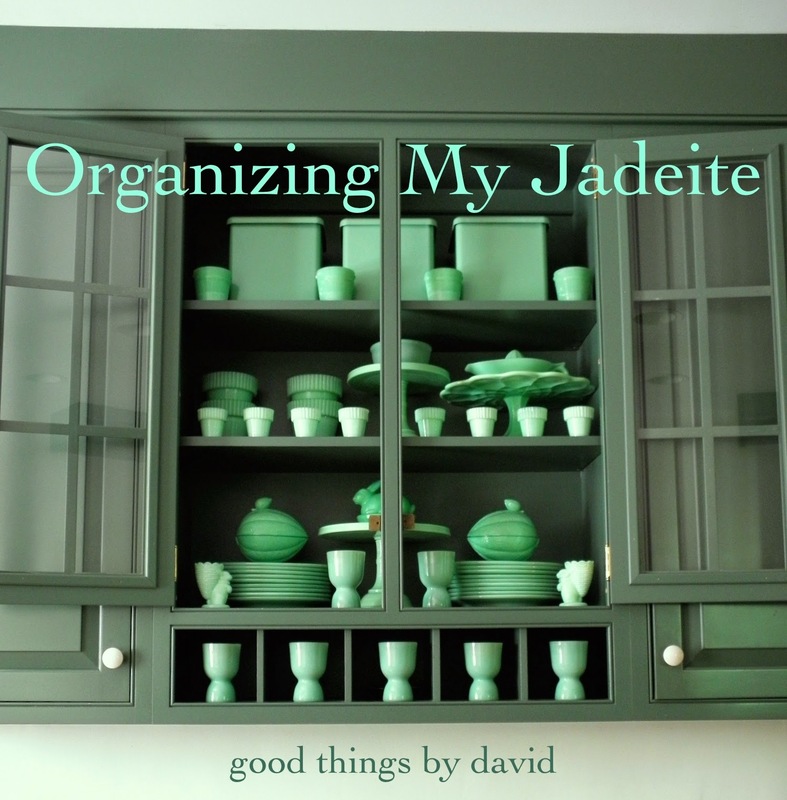 This overview shows you what my jadeite looks like at the moment stored in the kitchen. As you can see, the larger 12" L.E. Smith cake stand is too large to fit in the cabinet, so it sits on the counter. Hopefully I’ve created something which does a bit of justice to this wonderful American glass that so many people collect. With my budding collection all housed in one area, I am going to use it more often than in years past. I am a firm believer in using and enjoying what one collects rather than keeping it stored for that 'rainy day'. Why not bring a bit of joy into your life by displaying the jadeite that you collect in a coherent arrangement or in a controlled chaos, and then using it every day or on special occasions? I guarantee you will be reaching for this green glass regularly if you do display it. Absolutely beautiful.. I have to admit, I'm now obsessed with the Peale Green color.. it's magnificent! I love the way you organized all the pieces. Fabulous! As for the Peale Green, it is a nice hue that doesn't get boring. It's not trendy either. I don't know what it is about you, but you do have a good eye for arranging and for coordinating color. The photos that you present on the blog always have me drooling. Keep it up good sir! A most inspiring post! I love that darker green setting of the jadite! Now I want new cabinets. Thanks, M. Finlay & Bernie. I try my best to take good photos! M.F. : it's all about the lighting in my opinion. Bernie: The darker green is actually very soothing. I'm not a collector of anything because my home is small and I hate clutter, so I enjoy looking at what others collect. Your collection is beautiful and displayed very nicely, but what really impresses me is that you actually use it. That's smart! Thanks anonymous. I know, I don't like clutter too, so I try my best to keep things tidy. However, even I have to store things away in the attic or basement sometimes. For now, I'm happy with the way my jadeite is in the cabinets.